Teams is used to monitor performance of set of selected users. You can create/ edit/ delete teams, add members to teams, add teams, view team information. Note: To display sub-teams, click on button & to hide sub-teams, click on button. Step 1:Click on -> Selectc -> Click on button. Step 2: Enter team name, team description in the text boxes of below screen. To add a team image, click on button. Maximum image size = 5 Mb. Users can upload jpg, png or any image type. Default image for team will be . Step 3: Click on “Create” button to save the record or click "Close" button to exit. Step 1: Click on -> Select -> Click on icon in the “Teams” window. Step 2: Update the details of the team in "Update Team" window. Step 3: Click on button to save the record or click “Cancel” to exit. Step 1: Click on -> Select ->Click on icon in the “Teams” window. Step 2: Enter sub-team name in "Team Name" text box and description in "Team Description" text area in below window. To add a profile image, click on “Select Image” button. Using this option, you can create a new team under another team. 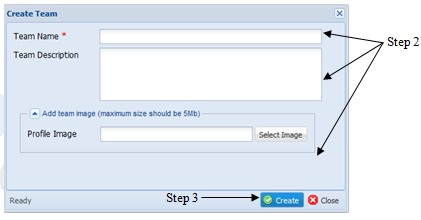 Step 3: Click on “Create” button to save the record or click “Close” button to exit. 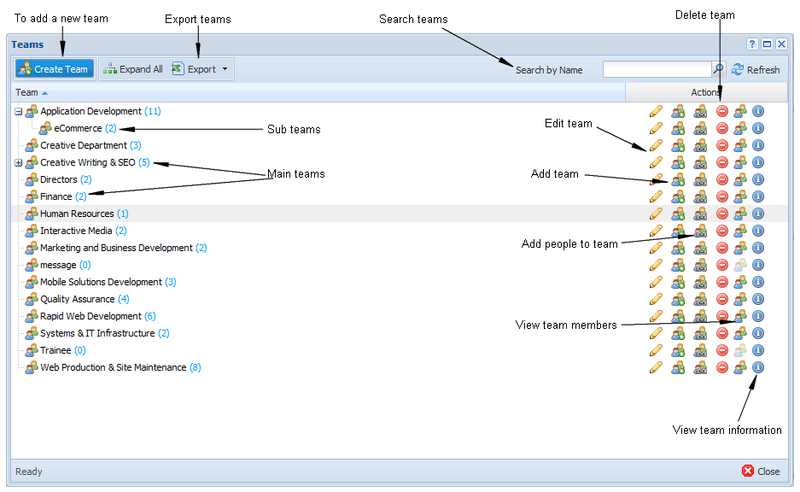 Step 2: Select the users need to be added from the "Assign Users Team" window. Step 3: Click on button to save the records. Step 2: Click "Yes" button in below screen or "No" button to deny operation. Click on -> Select -> Click on icon in the "Teams" window. This will display all information about the members of the selected team. Click on -> Select -> Click on icon in the “Teams” window. This will display all information about the selected team.